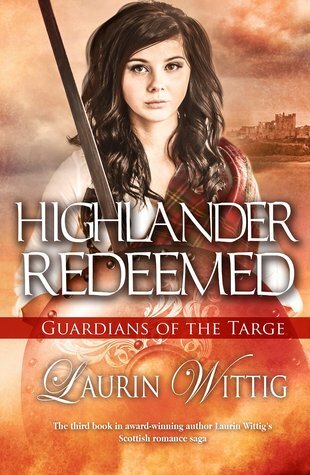 Highlander Redeemed is the final book of the Guardians of the Targe trilogy and while it can stand as a stand-alone, I would recommend reading the first two before diving into this one. It’s set in Scotland, during the reign of King Edward I (“The Hammer of the Scots”) when the tensions between the various clans of Scotland were warring with the King of England (and with each other, to be fair). Scotia MacAlpin, our heroine, is a feisty young woman who is sick of being seen in her older sister’s shadow. Determined to be a warrior (think Merrida from Brave), she begins to train herself in private, but her constant escapes into the woods has drawn the attention of the tribe council. The council assigns Duncan to watch over her and try to keep her in line, as it were. They strike a deal – if she trains very hard and is ever ready to, he will let her fight the English with the warriors of the clan. As the meet, their life long friendship begins to blossom into something else. In the meantime, other machinations of the clan are a foot. There’s a whole thing about whether or not Scotia is a Guardian, which appears to be some sort of position of power and prestige within their clan. It has something to do with a stone and being able to protect the clan and it’s never really well explained. This is – I am positive – because it was well established in the first two books. They were each about one of the other Guardians and I am sure if I had read the whole series this would feel like a wonderful culmination of a story. Instead, I found myself kind of annoyed with the distractions from the love story. Because of the Guardian business, Scotia and Duncan’s love story gets shoved a bit to the back, but when it finally culminates it is lovely. There are a few heavy make-out scenes before their wedding, but their “joining” does not happen until after their wedding. Wittig writes those scenes well and I felt very satisfied that they were… satisfied. As is only proper for a book set in Scotland, I enjoyed this one with whisky and would recommend you do so as well. My current favorite is Glenlivet’s Nadurra blend – a smooth but smokey drink from the Speyside area of Scotland. Highlands: The Scottish Highlands are a sight to behold and should be on everyone’s travel list. If you’d like to explore the setting talked about in the book, start your exploration at this site. Women Warriors: Scotia is far from the only woman warrior in Scotland – fictional and non. Check out this site for a exploration of the long legacy.